Let the experts in custom acrylic fabrication make your prototype a reality. Get in touch to get a free quote, we will respond within one business day! Acrylic plastics are a group of synthetic plastics that include Plexiglas, Lucite, Perspex, and Crystallite and many more. That’s because, when you work with M.A.S. Plastics, you’ll be working with experts in plastic and acrylic fabrication who will help you turn even your wildest visions into a reality. Our capabilities extend from the cutting, fabricating and molding of acrylic plastic to the creation and shipment of plastic components to supplying plastic rods, plastic sheeting and plastic tubing and anything else you might need. We’re equipped with all of the machinery, materials, talent and experience to provide high quality custom services for the most discriminating clients. We also have experience providing custom fabrication services in a variety of industries from homes to business facilities to mass production of lighting for the lighting industry. To put it simply – here at M.A.S. Plastics we’re completely crazy about plastic! When you work with us, you’ll be assured that we’ll use this passion, combined with our many years of experience in plastic fabrication, to take your ideas and turn them into art. Why ‘art’? Because, at M.A.S. Plastics, we go beyond simple plastic fabrication and provide design services that’ll help take your vision to even higher levels. We’ll work with you, side-by-side; to make sure you get the best final product possible in the shortest amount of time. We promise to deliver a high quality end product in just seven days after the first consultation – that’s how committed we are to providing the best customer services and helping you reach your goals. You’ll get all of this at very competitive rates as well. If you’re located in or around the Los Angeles area, contact us today at (818) 997-8064 to discuss the finer details of your project and organize a consultation with one of our designers. 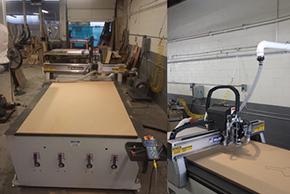 Our new CNC router allows us to work mass production jobs with the capability of cutting various hard materials including wood and aluminum, with ease.